Scandinavian style is known for its simple yet stylish appeal, featuring refined silhouettes and a neutral colour palette that looks great in any interior. 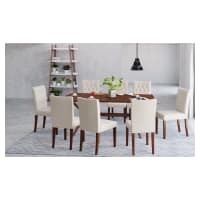 Opt for a stunning Scandinavian dining table to infuse an effortless sense of elegance into your home. 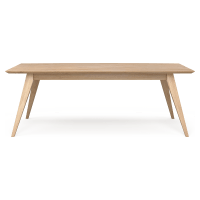 Discover Brosa's range of Scandinavian dining tables below for a comprehensive selection of styles and sizes. There are tables suitable for smaller homes and spaces, as well as larger Scandinavian dining tables perfect for entertaining, which will fit all of the friends and family. 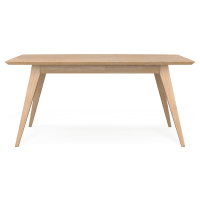 Take your pick from a range of shapes including Scandinavian dining tables with a round, square or rectangular surface. Match your table with an equally on trend set of dining chairs, with a variety of styles to choose from. Each Scandinavian dining table has been made from premium materials. Celebrating the beauty of natural wood, choose from pieces built from polished and strength tested materials. Instantly uplift your home with a Scandinavian dining table that has been crafted by expert makers and is designed to stand the test of time!